First Response Personal Fire Suppression Unit for Home, Shop, Auto, RV & Camping! Use to extinguish Class A and Class B fires. 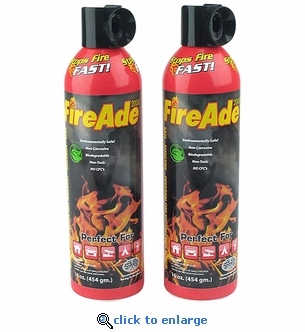 FireAde 2000 fire fighting agent is biodegradable, environmentally safe and easy to use. Quickly extinguishes fires involving wood, paper, cloth, oil, gasoline, flammable liquids and grease. Our 2 pack of 16 oz. fire suppresant units are ideal for extinguishing fires at home, auto, shop and camping. Keeping a FireAde 2000 extinguisher nearby can save lives and property damage. Many fire departments, law enforcement officers and racing safety crews carry FireAde 2000 fire suppression units for quick, first response to small fires and flammable fuel spills, eliminating expensive clean-up and damage to property.